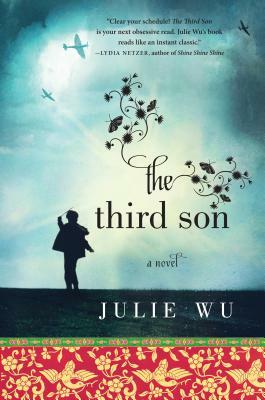 The Third Son, by Julie Wu, is populated by characters who are completely extreme. The main character, Saburo, is an extremely neglected child. His lady love, Yoshiko, is an extremely ambitious person. His parents are extremely strict and harsh. His older brother is extremely cruel. His cousin is extremely kind. The Americans are extremely wishy-washy. The cover is extremely pretty. I really did not enjoy this book. I don't know too much about Taiwanese culture, but if Julie Wu is correct, then third sons are so little loved that their parents can pretty much starve them so that they need to get injections due to severe malnutrition. Even when the family is wealthy. First sons get everything, and everyone else must fend for themselves. Poor Saburo never even got an egg. They all went to his extremely cruel older brother. The Third Son begins in Taiwan during World War II. Saburo is a young boy trying to escape an air raid, and he runs into a beautiful girl while trying to escape and hide. The two of them have a moment. Then the beautiful girl, Yoshiko, walks away, and Saburo goes back to his miserable existence. But he never forgets Yoshiko. He thinks about her as he gets expelled from school, thinks about going to but then never applies to college in the US, and pretty much any other time. Then he meets her again, but his extremely cruel older brother is interested in her, too. So Saburo has to find a way to win her back. I think there were many reasons this book just fell flat for me. First, I didn't really care much about Saburo or Yoshiko. I guess they were nice people, but Saburo was just really whiny and Yoshiko wasn't even in the book for most of the time. So I didn't really believe in this huge, epic love story between them because - well - I couldn't really see what there was to like in each other. And everyone else in the book, too, was just so exhausting to read about. I mean, seriously, Saburo's parents were just SO MEAN. And I didn't understand why, if they were so wealthy, they wouldn't just buy enough food to feed their whole family instead of only getting enough for themselves and their eldest son and not giving enough to everyone else. I don't think I fully understand just how the cultural norms worked. And even if a culture generally favors an eldest son, I don't think that means that they despised their other children, but that's what this book made it seem like, and it was hard to read. To me, the most valuable aspect of this book was the insight it provided into life in Taiwan in the mid-20th century. I didn't really know anything about the Japanese occupation and then the transfer of power to China, and then the crazy political machinations between different Chinese parties, becoming more and more paranoid. It was good to learn more about it, and I appreciate Wu for shedding light on a topic that we in the West don't hear much about. Not sure I would want to read this one but the cover is definitely awesome! My interest is piqued because although the novel is set in Taiwan, the names of the characters are Japanese. Did you get a sense of the Japanese community in pre-War Taiwan? Or was that not part of the story at all? I'm intrigued. I'm impressed that you made it all the way through - I have a feeling I would have given up.